Sorry there was some delay because of my official schedules on other matters. My Cashier in charge of power of attorney procurements in Accra-Ghana was not able to receive the doculent from the ECOWAS Court of Justice yesterday after the application was submitted on my behalf; but this document was only picked up from the Registrar’s office this morniny, and they have to wait for the next available flight to send to my Lome office for onward sending by DHL to you. Attached is a copy of the DHL parcel slip that was handed to me in few minutes ago. I have already designated my PA here in Lome to immediately go to any DHL office around because I was not personally in office at the time the power of attorney arrived here in my Lome office to go to send my self. Also sent along was the agreement already prepared. You will sign the agreement and the power of attorney to return immediately. 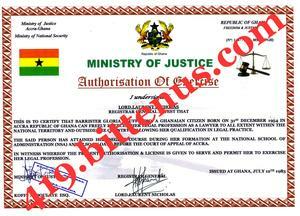 My legal seal is in Accra, but shall be brought to me here in Lome in the weekend. So, you will have to return all documents including the two parts of the agreement along the power of attorney after you sign so that I can insert my seal and return your copy and the legalized poer of attorney while I will retain my copy with. But meanwhile, I have put all machinary in progress to raise the needed sum of €123,500 for your PLOG immediately. Awaiting your prompt revert with the DHL information. My PA here told me that you will receive the parcel by this Friday so do make sure to sign and return immediately you receive the parcel. 2nd Floor Pyramid House, Ring Road Central, Accra-GHANA. Tel. : (+233) 023 676 4471. The the power of attorney has successfully legalized. View attached a copy of the legalized the power of attorney along with my international passport and license. Awaiting your payment of EURO 6,000 as soon as possible. Be informed that if we can make the payment for your PLOG by tomorrow being Friday 21 November 2014, then be assured of receiving your funds transfer by next week Friday. While sending the payment information of the remaining balance of EURO 6,000 for the completion of the payment of your PLOG also send along your designated bank account for the transfer of your funds to you by the ECOWAS Bank. Concerning your flying down to Togo, I would rather advise you to stay back in your country because you don't have to bother or stress yourself coming now until you have confirmed transfer of your funds in your account by next week. I have made myself very clear to you that I don't have the possibility of getting this remaining EURO 6,000 to complete the payment for your PLOG. At my age I don't believe in playing games or to waste my time and money. This is your inheritance we are talking about here not mine; I hope you understand this? If you can't send this remaining balance of EURO 6,000 to complete the payment for your PLOG I will not risk paying the EURO 117,500 I already have with me and at the end we will fail. Kindly look for ways to raise this sum from both family and friends around you over there in your country and send it directly to my name as receiver by Money Gram tomorrow or else I have to drop the case of your inheritance by Monday morning. Because we only have tomorrow to make this payment so that by early next week or at maximum by Wednesday next week the PLOG should be issued and legalized on your behalf. I only have next week to stay in Togo and to finish the matter of your inheritance; anything to try to extend this time will not work because this is the time I have to cover up all business activities for the year as I already closed business for this calendar year 2014. I will only advise you to send this sum of EURO 6,000 by tomorrow morning so as to enable me go to make this payment on your behalf tomorrow if not I have to sign for termination so that I can return back the EURO 117,500 I took from my bank in Ghana and find ways of paying for the charges which I have already incur on this loan. WE HAVE VERIFIED THE DOCUMENTS YOU FORWARDED TO OUR BANK. 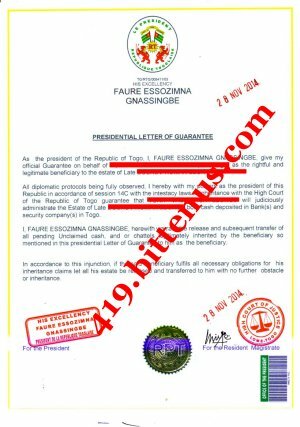 THE NEW POWER OF ATTORNEY AND THE PARTICULARS OF THE ECOWAS SENIOR ATTORNEYS ASSOCIATES MEMBER WHICH YOU HAVE SENT US HAVE BEEN VERIFIED AND AUTHENTICATED. THESE DOCUMENTS ARE GENUINE AND YOU CAN WORK WITH THIS LAWYER FOR THE CLEARANCE AND RELEASE OF YOUR ESTATE/INHERITANCE ON YOUR BEHALF. ALSO, THIS GLORIA AKUFFO IS A WELL KNOWN NAME WITHIN THE ECOWAS REGION WHOM YOU CAN TRUST 100%. WE NOW AWAIT THE SUBMISSION OF THE GRANT OF REPRESENTATION, AND OR LETTER OF ADMINISTRATION ISSUED BY THE PROBATE DIVISION OF THE HIGH COURT OF JUSTICE OF TOGO IN YOUR NAME AS THE BENEFICIARY TO ENABLE OUR BANK (ECOWAS BANK OF INVESTMENT & DEVELOPMENT, EBID) EXECUTE THE TRANSFER OF YOUR FUNDS TO YOUR CHOICE, AND OR DESIGNATED BANK ACCOUNT IN YOUR COUNTRY OR ANYWHERE YOU SO CHOOSE TO HAVE YOUR FUNDS TRANSFERRED TO YOU. BE INFORMED THAT WE HAVE IN OUR BANK (ECOWAS BANK OF INVESTMENT & DEVELOPMENT, EBID) AN OFFICIAL ADVICE TO PLACE AN INJUNCTION ON YOUR FUNDS PENDING TILL A DEADLINE OF WEDNESDAY DECEMBER 3, 2014 WHEN YOU SHALL SUBMIT A PRESIDENTIAL LETTER OF GUARANTEE FOR THE CLEARANCE ON YOUR INHERITED ACCOUNT. 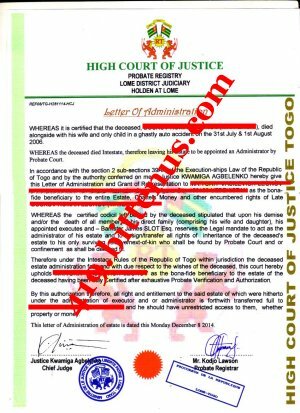 IF YOU CAN SUBMIT THIS DOCUMENT FROM THE SUPREME COURT OF TOGO TO OUR BANK YOUR FUNDS WILL BE RELEASED TO YOU FOR TRANSFER. THANK YOU FOR YOUR UNDERSTANDING AND COOPERATION WITH US. Please, find attached the receipt for the payment of your PLOG today! I have been able to make the payment for your PLOG this evening. The $7750 was not enough because there was shortage of money after exchange to euro (EURO ) at the black market; it was EURO 80 less the amount needed, I had to make sure that I get money from my secretary's salary to complete it that was the reason I took some time to go to the court. Nevertheless, I have been able to complete the matter of your PLOG today. I feel so fulfilled to do this on your behalf. We now wait to receive the PLOG by Friday this week hopefully. Please, find attached a copy of your PLOG. I have collected the PLOG this morning and gone to submit the original hard copy at the ECOWAS Bank on your behalf because this bank is in charge of the release and transfer of your inherited fund, I also made all the necessary copies for the offices and ministries involved on your behalf. I have been about this inheritance matter of yours since morning that was the reason I could not write to reply your messages because I want to make sure that I have completed this task and have a good result before responding back to you for complete information. With your PLOG already issued by the office of the president of Togo and endorsed by the High Court, I visited the TAX office for your account TAXATION CLEARANCE WAIVER today; in fact, I am just returning from the Tax office now because it is the last place I have visited as finished with other offices. I have deposited a notarized copy at the Tax office on your behalf. The total expenses I made today were $900 for notarization of the copies of your PLOG which I have submitted on your behalf. The good news is that we can make a TAX Clearance Waiver on your inherited account with the ECOWAS Bank within two days (or 48 hours) of application for this Tax Clearance Waiver. The cost is a total of EURO 7,325 (seven thousand three hundred and twenty five Euros) to be paid in cash to the Taxation Department of the Magistrates Court of Lome which is a branch of the Civic Courts of Togo on family property inheritance (FPI). The only problem is that I don't have this money to pay for your TAXATION WAIVER, so you will have to raise this sum as soon as possible within this week. We have until December 8, 2014 being seven (7) official days from the date of issuance and endorsement of your PLOG. If at the end of this date we could not make the application for this Tax Clearance Waiver on your account with the ECOWAS Bank, this opportunity will be canceled and withdrawn from you, and we will then have to pay 15% of $2,968,352.50 which will be $445,252.88 as Taxation Clearance Waiver and you know that this will be too much on the high side for you to pay. If you can it is very wise, safe and better for us to secure this Tax Clearance Waiver now before it will be late. We have within this week to make it happen to avoid the unpleasant and unseen event from happening concerning your inheritance. NOTE: Do not distribute this document to anybody on the internet. I would like to express my deepest disappointments with you; I must tell you that I am seriously disappointed in you for distributing your inheritance documents on the internet after I have warned you of the sensitive nature of my involvement in your case. Even after I instructed you not to contact my office again you still keep sending your mails to my office email address; have I asked you to solicit for money on my behalf? Well, kindly view the attached for the revised MOU (our working agreement); please, do not distribute it to any third parties this time, not even to my offices as you recently have done. Do not send copy to anybody, because if you do you will be violating my legal prerogative and right with you then I will be forced to withdraw from your inheritance case. And I believe you have more to loose than me on your inheritance case, remember? This AGREEMENT has been rewritten at my instruction to the appropriate department of my office. This agreement must be legalized in the complete two parts before sending it to you by DHL for your signature endorsements and to only return one part back to me. Awaiting your approval and payment information asap. ..... (Hereinafter referred as Proprietor which will include, him and his proxy’s etc) on the one part, acting as the initiator of this Partnership. GLORIA AKUFFO, SENIOR ASSOCIATE ATTORNEY/ BLAY & ASSOCIATES, 2nd Floor Pyramid House, Ring Road Central, Accra-GHANA tel. +233-23-676-4471 (hereinafter called as Representative Trustee and / or Business Partner, which will include her and her proxy’s) on the other part. NOTE: THIS IS A CONFIDENTIAL MAIL & INFORMATION; NOT TO BE DISCLOSED OR DISTRIBUTED TO THIRD PARTIES. 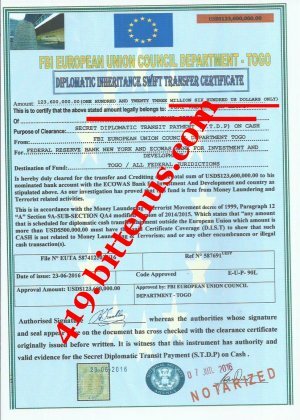 THIS IS TO OFFICIALLY INFORM YOU OF THE TRANSFER OF YOUR FUND BY A DIPLOMATIC CASH DELIVERY/TRANSFER. VIEW THE AIRWAY BILL ATTACHED FOR YOUR PERUSAL AND PRINT OUT FOR YOUR REFERENCE TO RECEIVE YOUR CONSIGNMENTS FROM THE SECURITY COMPANY DELIVERING YOUR CONSIGNMENTS; ALSO THE GRANT OF REPRESENTATION/LETTER OF ADMINISTRATION IN YOUR NAME DELIVERED TO OUR BANK FOR THE RELEASE AND CLEARANCE OF YOUR INHERITED FUND IS ATTACHED FOR YOUR PERUSAL AS WELL. THIS DOCUMENT IS FOR OUR BANK'S USE ALONE; IT WAS ISSUED AND DELIVERED BY THE PROBATE COURT OF TOGO TO OUR BANK'S MANAGEMENT BOARD FOR APPROPRIATION OF YOUR INHERITANCE. 8. TOTAL FUND (MONEY) PACKAGED: 123,600,000.00$(USD) [ONE HUNDRED AND TWENTY THREE MILLION, SIX HUNDRED THOUSAND DOLLARS ONLY); YOU ARE NOT TO DISCLOSE THIS TO THE DIPLOMAT OR TO ANY OTHER THIRD PARTY(S). NOTE: THE SECURITY COURIER COMPANY AND THEIR DIPLOMAT DO NOT KNOW THE CONTENTS OF YOUR CONSIGNMENT TRUNK BOXES TO BE MONEY, THE BOXES WERE DECLARED FAMILY ASSETS/EFFECTS; YOU ARE THEREFORE REQUIRED NOT TO DISCLOSE OR REVEAL THE CONTENT OF YOUR CONSIGNMENT BOXES TO ANYBODY, WHEN ASKED SAY THEY ARE YOUR FAMILY SACRED ANTIQUES AND PROPERTIES. THIS IS A SECRET BETWEEN YOU AND OUR BANK ALONE. A CERTIFICATE OF FUND CLEARANCE & ORIGIN SHALL BE ISSUED BY OUR BANK AND SENT TO YOU ALONG THE KEYS TO OPEN YOUR CONSIGNMENT BOXES UPON YOUR CONFIRMATION OF RECEIPT OF YOUR CONSIGNMENT TRUNK BOXES. YOUR INHERITED ACCOUNT HAS BEEN TOTALLY CLEARED UNDER THE INSURANCE CODE AND PART OF THE OVER DUE PROFITS MADE FROM YOUR DEPOSIT ACCOUNT WERE USED TO PAY FOR THE INSURANCE COVERAGE OF YOUR FIVE(5) DIPLOMATIC CONSIGNMENT TRUNK BOXES AFTER YOUR FUND WERE PACKAGED FOR DELIVERY TO YOU; YOU ARE THEREFORE ONLY REQUIRED TO PAY FOR THE CARRIAGE CHARGES OF THE TOTAL SUM OF 28.500EURO (EURO) IN YOUR COUNTRY WHEN THE DIPLOMAT (MR. TONY MORGAN) WILL ARRIVE TO DELIVER YOUR CONSIGNMENTS TO YOU IN YOUR ADDRESS. THE DIPLOMAT, MR. TONY MORGAN, WILL CALL YOU AT HIS ARRIVAL IN YOUR CITY BECAUSE YOUR EMAIL ADDRESS AND TELEPHONE WERE INDICATED AND GIVEN TO THE SECURITY COMPANY TO REACH OR CONTACT YOU UPON ARRIVAL. YOUR CONSIGNMENTS ARE COVERED UNDER THE DIPLOMATIC CARRIAGE AND THEREFORE NO CUSTOM OFFICER OR AIRPORT AUTHORITIES WILL INSPECT THE CONTENTS OF YOUR CONSIGNMENT IN ANY AIRPORT, YOU WILL BE REQUIRED TO BUY DIPLOMATIC STICKERS ONLY FOR CLEARANCE. AND YOU WILL ONLY NEED TO PAY THE BALANCE SUM OF 28.500EURO (EURO) TO THE DIPLOMAT WHEN HE ARRIVES. WHEN YOU CONFIRM THE RECEIPT OF YOUR CONSIGNMENTS WE SHALL THEN SEND TO YOU BY FEDEX THE KEYS TO OPEN YOUR CONSIGNMENTS ALONG YOUR FUND CLEARANCE & FUND ORIGIN CERTIFICATE; THIS IS FOR SECURITY REASONS THAT THE KEYS WERE NOT SENT TO YOU YET. TODAY MARKS THE THIRD DAY YOUR CONSIGNMENTS WERE SHIPPED AND FOR SAME SECURITY REASONS YOU ARE NOTIFIED ONLY TODAY BECAUSE BY SUNDAY YOUR CONSIGNMENTS WILL ARRIVE , IT TAKES FIVE DAYS FOR DIPLOMATIC DELIVERY. I was only able to get the payment receipt from the Registrar General's office few minutes ago. The reason was because that the court needed it to finish their issuance of the Return Order to the ECOWAS Bank and diplomatic courier company on your behalf today. I have been informed also that the Return Order shall be out later this night and it shall be served directly to the ECOWAS Bank and the diplomatic Secouriy courier company on your behalf by the publicity department of the high of justice of the republic of Togo. So we await good news by tomorrow by the grace of God Almighty. Tel. : +233 (0) 23 676 4471. Attention: ECOWAS BANK FOR INVESTMENT & DEVELOPMENT / MARSET SECURITY & DIPLOMATIC COURIER AGENCY, LOME-TOGO. Re: FINAL APLICATION APPROVAL FOR THE IMMEDIATE RETURN OF 5 FAMILY ASSETS METALLIC TRUNK BOX IN THE NETHERLANDS. 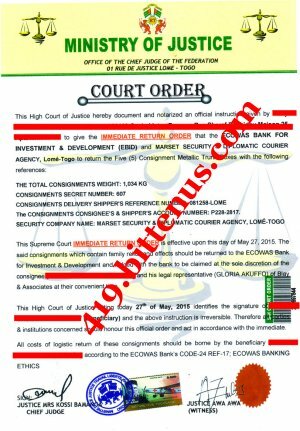 In sequel to the initial official Supreme court's NOTICE issued to ECOWAS BANK FOR INVESTMENT & DEVELOPMENT / MARSET SECURITY & DIPLOMATIC COURIER AGENCY, LOME-TOGO dated May 26, 2015, this is hereby the final proceeding and Court's ORDER issued & legalized dated this day of May 27, 2015 on behalf of for the immediate return of the consignments deposited in Amsterdam in the Netherlands. 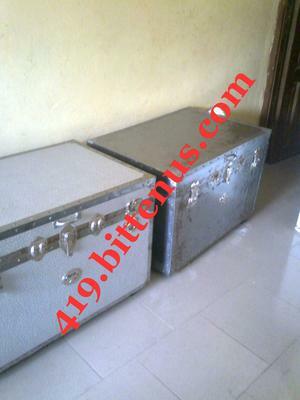 We hope that all negotiations have been concluded for the return of these five (5) metallic trunk boxes back to the ECOWAS BANK FOR INVESTMENT & DEVELOPMENT here in LOME-TOGO for the onward & unrestricted claim of these consignments by the beneficiary/owner here in Lome-TOGO without further hindrance whatever except for the payment for the cost of freights of these consignments by the owner . All formalities of returning these consignment trunk boxes should be observed by the parties so addressed in this correspondence of the attached legalized document of S-H COURT ORDER. The original hard copy has been sent to the bank by our local courier delivery service for appropriation. On behalf of the C.J of the Supreme High Court of Togo this day of May 27, 2015. In sequel to your forwarded mails, documents and correspondence to my office, you are advised to comply with the request of the ECONOMIC COMMUNITY OF WEST AFRICAN STATES BANK FOR INVESTMENT & DEVELOPMENT "EBID " to enable them fix the return of your consignments and money. Your are advised that all formalities of returning these consignment trunk boxes should be observed by the parties so addressed in the legalized document of S-H COURT ORDER already issued. On behalf of the C.J of the Supreme High Court of Togo this day of June 2, 2015.
hello papa . you can to say first the money amount that you want court to reduce for returning first before I can to go to Lome to meet the necessary court's officer to explain that our family was under the threatenings of some people we don't know to kill us and to kill you if you come to Lome before. Because I cannot write by email and get good result because I must to go first to meet the officer to explain me personally so that they can see that it was truth we say to them. But I can also to write by email but I know that because they don't know me for your transaction because there is no Power of Attorney to my name for your behalf, OK? You should know that we don't have much time left because at the stipulated time given for the schedule for returning your consignments will be elapsing by next week Friday and that will spell a woe to you and me; remember, my legal firm is at stake and the huge debts which I have incurred on this case of your inheritance. So whatever you are doing you should do very quickly to savage the situation before it becomes too late for us. Hello dear , it was not easy to get this document but I was able to get it after all the stress and payment. I am going to the bank now to submit the original hard copy to the ECOWAS Bank for their use as required on your behalf. A cognitive study has been done of the ECOWAS Banks's Correspondences with you which you have forwarded to us, and the court's investigative arms were dispatched to do a thorough investigation on your behalf. Our findings came out that the ECOWAS Bank is still in the ambit of the legal premises governing the return of your consignments to the bank. 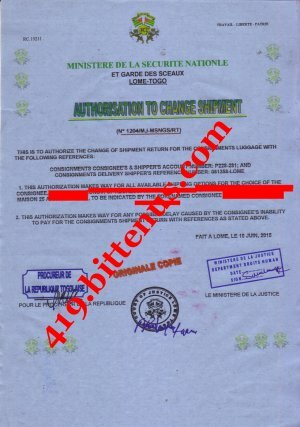 You are therefore legally advised to follow up promptly the bank's request for the payment sum of 6886,80$ to their Logistics & Forwarding Unit so as to enable the bank facilitate the return of your consignments to their facilities here in Lome within the stipulated time. Kindly, do all that is within your reach to find the money and pay it as requested by the ECOWAS Bank for this purpose and you will not regret doing so. Because this is the only way to receive back your consignments for appropriation of your inherited fund. We hoe for your prompt cooperation with the ECOWAS Bank to avoid delay and confiscation. Now, I have seen the mail from the court you sent to me this morning. So, what is your plan now? I have already told you what I can and what you can do to help me to help you solve this situation. You are the only delay to this process. Be informed that beginning from Monday the demurrage to your consignments was activated which cost the sum of EURO 20/day (twenty Euros per day). I can only afford for the demurrage cost from that Monday till today which is EURO 60 (sixty Euros for three days); any further delay from today you will have to bear the cost. I want you to bear in mind that any further delay I will not take any responsibility for such because I have already done all my best morally possible on your behalf by raising a total of $5,500 from the total of $7,000. 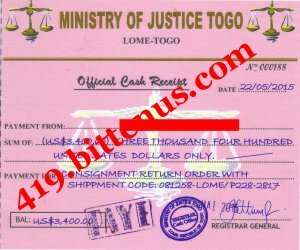 Now, because of the time limitation, you will have to send this sum of $1,500 to my name via MoneyGram directly in Togo because there is no much time left for us again to delay any further. My legal advice for you now is to go and plead with the person who gave you the $700 you last sent me so that this person can for this last time help you after which he or she will receive reimbursement for the money borrowed by you because once this shipment return fee of about $7,000 is paid today or at most tomorrow morning within one week your consignments should be back to the ECOWAS bank in Togo and your fund credited to you and you can pay back all the money you have borrowed. Awaiting your payment confirmation of the sum of $1,500 asap to enable me proceed from my end here. The validity of the demurrage halt of your consignments is valid till the expiration of the 6 months placed on your consignments before the official seizure in the Netherlands. This application was made to the Magistrates Court of Lome Province directly on your behalf and there was no way my PA could get a copy of it because it was an official governmental application and instrument by the court to the Diplomatic Security Company on your behalf. The only thing was that the bank called me to inform me of the status cancellation on your behalf. My PA will be flying back to Togo at noon today as I have earlier told you yesterday. Please do all your best possible. hello papa . I cannot with my family get any money because all family is not have any money up to even though 10$. nous avoir pas de l'argent, maintenant est rien. Depuis hier, je ne peux que maintenant la somme de 200FCFA pour acheter billet d'Internet le temps de vérifier mes courriels lorsque je reçus votre message SMS sur mon téléphone. WE WISH TO INFORM YOU THAT YOUR NEW ACCOUNT HAS BEEN SET UP FOR YOUR FUND TO BE CREDITED INTO IT FOR YOU. WE SHALL BE ABLE TO CREATE YOUR NEW MASTER CARD UPON CREDITING YOUR NEW ACCOUNT WITH YOUR FUND. AND YOUR IBAN FOR INTERNATIONAL WIRE TRANSFER SHALL ALSO BE OUT UPON CREDITING YOUR INTO YOUR NEW ACCOUNT WITH US. WE DON'T AS A BANK BEAR THE RESPONSIBILITY OF GETTING A DIPLOMATIC INTERNATIONAL SECURITY TRANSFER CERTIFICATE (DIST CERT. ); THIS IS THE SOLELY THE COST OF A CUSTOMER RECEIVING FUND FROM OUR BANK AT THE POINT OF DELIVERY AND NEGOTIATION WITH THE CUSTOMER'S BANK IN THEIR COUNTRY OF RESIDENCE OR RECEIVING COUNTRY. Hello dearest, I want you to send the D.I.S.T Certificate money to Togo with the name below for the immediate processing before I arrive there for collection and submission for the immediate release and crediting for your inherited fund from the Federal Reserve Bank in America to your new account with the ECOWAS Bank there in Togo. Kindly send the sum of $1,070 (one thousan seventy dollars) by Money Gram or Western Union so that there will not be any delay for the payment of the D.I.S.T Cert tomorrow before my arrival in Togo tomorrow evening or Saturday morning. But the required sum for the D.I.S.T Cert is a total of $915 but because of the delay we need to have extra atestation charges for express and unrestricted issuance of the D.I.S.T Certificate for the immediate release and transfer of your fund. Waiting for your payment information as soon as you make the payment tomorrow so that I can forward it to them immediately. Essi AVEKO is my confidant now there in Togo who I am now using for all my legal works and trustee. Hello dearest, see attached for your record the payment receipt for your D.I.S.T cert. The D.I.S.T certificate will be out on Monday. And I need to be there in Togo before Sunday so as to enable me properly prepare for the legal proceedings on your behalf for the immediate release and transfer oof your inherited fund as required. Waiting for your payment info asap. I want to congratulate you in advance because it was all success today. I want to inform you that after the notarization of the D.I.S.T cert at the court this afternoon immediatey was submittedd for the Federal Reserve Bank of America for the immediate release and transfer of your fund by Wire Transfer. I am very positive that the transfer will be executed before tomorrow evening ad the swift wire transfer copy will be forwarded to us (you and me) for our copy. Normally it take as maximum of three banking days to have the fund credited into your account after the transfer has been executed. See attached for the copy of the notarized D.I.S.T certificate for your record and perusal. As stated in our previous email to you, neither the Board of Governors of the Federal Reserve System (Board), nor the Federal Reserve Banks operate, offer, sponsor, or engage in any commercial dealings with the general public . Please be advised that any message you received stating that you are the beneficiary of a large sum of money and that a Federal Reserve Bank or the Board is involved with a funds transfer to your account, or similar promise, is fraudulent. The documents you have provided also appear to be fraudulent documents. Any solicitations you have received claiming to be from a person representing themselves as member of the Board or Federal Reserve bank is fraudulent. The Board is advising consumers that it does not endorse such solicitations, nor does it have any involvement in them. We advise you to not provide these solicitors with any personal information and ignore future correspondence from them. If you have provided these fraudulent people with your personal and/or financial information, we suggest you contact your bank to alert them of this situation to prevent someone from attempting to illegally withdraw funds from your account. If you believe you have been the victim of identity theft, or if you would like to report criminal activity in your jurisdiction, you may wish to contact your local police department for further assistance. Unfortunately, we are unable to assist you further. Hello dear , I am still waiting for your positive feedback since morning. Kindly see attached for the wire transfer of your fund that was executed by the Federal Reserve Bank before, use it as guarantee to get the required balance of $1,350 from your creditors urgently because if we fail today that means we have completely failed to bring this your inheritance case to a successful end due to your lack of urgency. The only thing hold back your fund worth $123,600,000.00 (USD) now is this balance of $1,350 which I have already explained to you time without number what you must do for me to be able to succeed on your behalf if I should take the risk of flying to Togo this last chance. I just want to tell you how happy I am today because we have good news already. The Ministry of Finance of Togo has completed the approval certificate for the immediate release and crediting of your inherited fund to the ECOWAS Bank in your favour today and the Federal Reserve Bank of New York will make the swift crediting into your account with the ECOWAS Bank tonight and copies of all documents will be released to me tomorrow and I will forward same to you while the ECOWAS Bank will contact you to send you the DHL courier parcel of your MASTER Card and Bank Cheque Book tomorrow before night. I am so happy that we finally have our breakthroughs and victory after the long fought battles ! Thank you for your cooperation and patience all through the hard times ! WE WISH TO INFORM YOU THAT YOUR ACCOUNT HAS BEEN CREDITED LAST NIGHT AND ATTACHED IS A COPY OF YOUR BANK ACCOUNT STATEMENT FOR YOUR REVIEW AND VERIFICATION. ALSO, TO ENABLE US SEND YOU YOUR MASTER CARD AND ACCOUNT CHEQUE BOOKLET, YOU ARE REQUIRED TO SEND US THE SUM OF 550$ TO COVER FOR THE COST OF DHL SHIPMENT AND AIRWAY INSURANCE FOR THE FULL PROTECTION OF YOUR ACCOUNT MASTER CARD AND CHEQUE BOOKLET. UPON YOUR EMAIL CONFIRMATION THAT YOU HAVE RECEIVED YOUR ACCOUNT PARTICULARS YOUR PIN CODE WILL BE SENT TO YOU BY EMAIL OR DHL DIFFERENTLY. THE REASON WE CANNOT DEDUCT THIS COST IS BECAUSE YOUR FUND IS COVERED ON AN INSURANCE WHICH PROHIBITS OUR BANK FROM DEDUCTING ANY AMOUNT FROM YOUR FUND. ONLY YOU HAVE THE RIGHT OF DOING THIS BY ISSUING OUT A CHEQUE FOR CASH PAYMENTS; AND YOU CAN ONLY DO THIS WHEN YOU HAVE RECEIVED YOUR ACCOUNT CHEQUE BOOKLET IN YOUR HAND BECAUSE YOU WILL NEED TO SIGN WITH YOUR SIGNATURE TO VALIDATE A CHEQUE FOR PAYMENT OF ANY SUM. 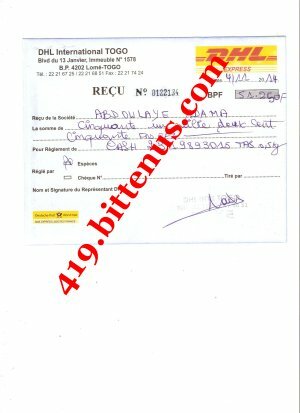 KINDLY SEND THIS REQUIRED SUM OF 550$ TO YOUR LEGAL REPRESENTATIVE OR INSTRUCT HER TO BRING THIS SUM TO OUR BANK TODAY SO THAT WE CAN BE ABLE TO SEND YOUR MASTER CARD AND ACCOUNT CHEQUE BOOKLET TODAY OR TOMORROW MORNING ON A HIGH TOP PRIORITY DHL COURIER PARCEL DELIVERY WITH WILL TAKE A MAXIMUM OF THREE (3) DAYS TO ARRIVE YOUR ADDRESS IN YOUR COUNTRY. WAITING FOR YOUR PAYMENT OF 550$ URGENTLY TODAY ENABLE US ARRANGE YOUR DHL SHIPMENT AND AIRWAY INSURANCE FOR YOUR PARCEL TODAY. I was just coming out from the ECOWAS Bank when I called you. We are required to make a payment of $550 for the costs of DHL courier service and Insurance for your parcel of Master Card and cheque book. The told me that they cannot deduct this cost from your account because your fund is under insurance coverage and only you have the right to withdraw money from your account by using your Master Card and or your cheqie book to issue payments to any other person. So, kindly send me this sum of $550 by MoneyGram to my name very early tomorrow morning so that I can go and make the payment on your behalf tomorrow morning and the ECOWAD Bank will then be able to send you your DHL parcel of your Master Card and Cheque book. and do send the money ($550) by MoneyGram to the name of Essi AVEKO for faster processing because of my health as I am not very strong to move around before going to the ECOWAS Bank on your behalf. I have to be very careful with my health this time around because I don't want to be too stressed out. So that Ms. Essi can assist me to go to the MoneyGram because the place is a bit far from where I live here in Lome. Thanks for your mail, i have ordered my secretaryy to contact your lawyer Gloria Akuffo, i will be waiting to hear from Gloria Akuffo. Let me explain to you how this works, your money has been confiscated , untill it is released to you, no body can withdraw any money from it, which means that you will have to sendto us the money so that we can help you to procure the document after which your fund can be released to you and your cheque and master card can be sent to you in your country. Get back to me so that i can send you the name again which you will use to send the money to us. OK good. But you have to understand that you will not be required to pay for the $6,000 that you are talking about because it is the reason I have asked you to send me the sum of $350 this morning so that I can get access to the presidency this morning on your behalf and this is in your best interest so that you can get your MASTER Card and Cheque book then you can withdraw money from your account to clear all our debts. If you want to succeed this last time then go ahead and sell whatever you have and send to me by MoneyGram this sum of $350 immediately so that I will be able to do my legal duty as your lawyer and legal attorney / representative. I am waiting for your payment information immediately. Thank you for your prompt and positive cooperation with me this morning. 2nd Floor Pyramid House, Ring Road Central, Accra-GHANA . Dearest , you don't have to pay $6000 again because you are not required to pay any more money after this Presidency's Guarantee Letter notarized. I have exhausted all means to get more money that is why I have asked you to find this very remaining $205 and send it to me by Monday morning because of the time frame limit that we have to get this done. Yes, in your DHL courier parcel to be released and delivered to you is your MASTER Card and Cheque book. Everything is inside the DHL parcel. You will write to me a first Cheque of $500,000 before I will then fly over to visit you in your country. But what we need to do now is to for you to be able to send this balance $205 required to get your DHL parcel delivered to you. I have received the payment receipt this afternoon and the copy forwarded to the department of DR CHRIS KOUMAKA DIRECTOR GENERAL of ECOWAS FINANCIAL MONETRY COMMISSION and the ECOWAS Bank on your behalf. Attached is the copy of the payment receipt I have already made on your behalf. Now, the bank will contact you today or tomorrow morning to inform you when your MASTER Card and Bank Cheque book will be delivered by DHL to your home address. I have gotten a blank copy of your account Cheque earlier today from the bank and asked that it be filled to illustrate an example to you so that you will know the appropriate way to fill and sign it and send to me by DHL after you have received the Cheque in your hand so that you will be able to write a cheque of $500,000.00 to my name. you can see the attached copy of your account Cheque filled by a banker echelon for an example. Kindly get me informed once you have been reached by the ECOWAS Bank. Note: never you respond to DR CHRIS KOUMAKA DIRECTOR GENERAL of ECOWAS FINANCIAL MONETRY COMMISSION again nor reply to their message because the department have been blocked from your fund transaction, and your account MASTER Card and Cheque book have been retrieved from them. Attention , I am with your lawyer here since morning Mrs Gloria Akuffo, after all documentations and negotiations, we cannot accept what she has requested due to our France comptroller general's head office in Ile-de France who has order that all such package be dully paid for at regional comptrollers head office before dispatching and shipment out of place of origin to final destination to avoid seizure of transit. I am so amazed that you have not still till now put all your confidence in me concerning the success of your inherited funds. Don't you know that I have explored all the avenues including this very letter from the Bank dated 26.03.2014 that you are referring me to? I had already visited the bank from the beginning of this excise but I was told that this letter has already expired because we could not legalize it at the time that it was valid in 2014 that the window was open for this. And since the bank has already told me this from the beginning they assumed that I have already explained to my client so that is the reason they did not answer you about this because it was not official anymore as the time had already passed. I am waiting for you to send this $1,395 today as early as possible to enable me proceed on your behalf immediately. We are all suffering now because you have not received your MASTER Card and account Cheque book. Please, hurry up and go to send me this sum so that your parcel can be released and sent to you today. Attention , sorry for delay in reverting back to you on your question. I had a short trip to France over the weekend on official trip to France for weekly reports on Airport Transaction Activities of the Comptroller's Departmental Unit of Togo to France. I have just arrived few moments ago. To answer your question: the total amount required was 2790$ (USD) [TWO THOUSAND SEVEN HUNDRED AND NINETY AMERICAN DOLLARS] not 279$ (USD) [TWO HUNDRED AND SEVENTY-NINE AMERICAN DOLLARS]. 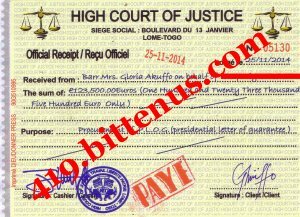 Total amount paid in initial deposit into our systems by your lawyer is 279$ + 1116$ = 1395$ (USD). Remaining balance is 1395$ (USD) to be paid for your DHL parcel delivery to get into your hands in your country. We wish to inform you that you have till Wednesday 21 December 2016 to pay this money upon failure to comply will result in your DHL property loss. All initial payments are on Caveat Emptor deposit; therefore you are strongly advised to comply to avoid your PROPERTY LOSS procedures. NOTICE: You package of Master card and ECOWAS cheque-booklet is held up here at our airport comptroller general office in junction with the France International Regulatory Commission due to the prohibition of the content of your delivery package. You are hereby mandated to pay up the sum of 1395$ (USD) the immediate release clearances and delivery of your package to you . Your DHL package is now ready for delivery to you with immediate effect upon payment of your balance 1395$ (USD) to enable us clear up with the International Authorities on your behalf to avert unnecessary checks and impounding of your package. We shall have our Semi-End of Year 2016 Reports submitted to our France Headquarters Office by Thursday 22 December 2016 after which you will not be able to claim your parcel anymore on failure to comply with our directives. I have earlier informed you about this danger. What do we do now? I will rather that we risk using the Embassy option because it will intervene for us on this situation. Or, is it possible for you to get this sum of $1,395 by tomorrow to send down? Because once we are able to pay this sum of $1,395 before the deadline that will mean that we have already succeeded and you will have abundant money in your hands because you will then receive your MASTER Card and account Cheque book so that you can write a Cheque of our earlier agreed amount of $500,000.00 to send to me by DHL to enable me cash out money and clear all outstanding debts and then be able to join you up in Moscow-Russia as we have earlier discussed. Hello dearest, I was just coming out of the embassy of France now after I was granted to meet the Ambassador. I immediately went to pay the money for the embassy Ticket Pass after I received your payment balance of $150 this morning. Now in my presence the Ambassador called the Comptroller General's office of Togo and immediately was referred to the Headquarters in Ile-De France to negotiate the immediate release & shipment of your DHL parcel delivery to you but the Ambassador was informed that it was in accordance with their International Airport Regulation Controls that requested this new exercise to be followed proficiently to avoid International Monetary Irregularities. But the Ambassador was able to use his honorable office to secure more time for us on a fourteen official working days; so by tomorrow there shall be no seizure of your DHL parcel again until we are able to get the balance sum of $1,395 with a 15% discount reduction therefore we are only to pay $1,185.75 (one thousand one hundred and eighty-five dollars, seventy-five cents only) upon which your DHL parcel will be immediately released and delivered to you. Now, to secure this safety, we are required to swear a Customary Court of Lome Affidavit in your name covering this exercise so that I can go to submit it at the Ambassador's office tomorrow morning on your behalf to enable the Ambassador fax it to the Headquarters of Ile-De France tomorrow before he will vacate official duties tomorrow evening. Note: this Customary Court of Lome Affidavit will cost a total sum of $99.5 (ninety-nine dollars, fifty cents only); kindly send this sum to my name first thing tomorrow morning. I have a very big problem now. I have arrived since 2PM but I can't even visit the department of the Comptroller General since my arrival because I don't know how I have misplaced my hand bag in which I have my money before I boarded the plane to come to Togo at the airport in Accra. I have been crying since yesterday and I have lost my voice because of too much tears for the loss of my money and some other valuables in my hand bag. now I can't even be able to go back because I only have just $50 in my pulse. I was just completely confused since yesterday. I don't know what to do now. You have only tomorrow Monday being 13 March 2017 and Tuesday 14 March 2017 to complete this process unfailingly after which if you do not comply your DHL parcel will be returned to Togo department unit. Sorry to inform you Sir, there is no more way possible to retrieve any money from this wicked man; all you have to do now is try and make it up tomorrow to pay the sum of 427$ as early as possible tomorrow so that you don't have to lose your DHL Parcel to the intentions of that criminal who is only interested in making you spend your money unnecessarily and who wants to frustrate you and efforts of your lawyer, AG of Ghana, Ms. Gloria Akuffo. Because if you fail tomorrow to make the payment for the sum of 427$ for your International Anti-Money Laundry & Financial Crime Commission (IALFCC) certificate as required/necessary, that will result to a total or complete failure to receive your DHL Parcel package and you will have a complete lose; and you then have to start all over again or you will better fly to the Republic of Togo to have a direct access to your bank account and fund. And I believe it will be more easier and cheaper for you to send that sum of 427$ since you now have your DHL Parcel very near to your destination than to lose all the money and time you have spent so far and then start to spend all over again in trying to fly to Togo and start a very long process of legal action that may wear you out because of the time and it may take from you. You just think about, it's a little advice from my imagination for you if my advice will be reasonable to you. Note: Your DHL Parcel package is presently in the City nearest to your City ; so do all that you can to clear your package to be easily delivered to you tomorrow evening once you can make the payment sum of 427$ in the morning tomorrow! Once you can pay that sum of 427$ tomorrow morning that will be a winning situation for both you and your legal representative considering her schedules which may not allow her the much time needed to fight this case for you. All you need to do now is completely ignore that Louis V. SIKA (D.G) and get your DHL Parcel tomorrow evening after you have made the payment of 427$ tomorrow morning to the Republic of Togo. This is the only sure guarantee to save you all the unnecessary stress and waste of money more than necessary. I have been able to secure some amount from your late lawyer's son, Kesenanu who presently lives with the mother in the city of Kara in Togo. He and the mother have been able raise a total sum of $150, but they will keep $50 for their family upkeep and his transport fair to Lome to meet with David to hand the sum of $100 to David and accompany David to give the total sum of $500 to the director who should sign your certificate on Monday. So you are to send the balance sum of $400 to the name of Kesenanu Slot Komlanvi very early on Monday morning so that he will receive it and hand the total sum of $500 to David while he will accompany David to make the payment for your certificate to be signed. Kesenanu promised to travel to Lome tomorrow afternoon if we can give him guarantee that you will complete the money on Monday if no positive word of concrete promise from you he will not move and they are not ready to send the $100 to David but must be by hand to hand delivery of cash and he must be with David while he pays the $500 to director and the certificate is signed in his presence too to make sure that you receive your MASTER Card and Cheque book and to send them money after you have received your DHL parcel before he goes back to Kara from Lome. If you can do this let me know immediately and you should also write Kesenanu to assure him so he will leave for Lome tomorrow afternoon. > What do you expect me to say to you that will convince you otherwise after all you have made me go through because of your inheritance case and the huge debts which I had incurred because of you and there was no appreciation from you to me? Since you have refused to follow my instructions and orders to send the $500 and you are making things difficult for me to solve all I had to do is to say something that will make you feel the pains I was feeling too because you have not acted like me good client should act. > Since I knew you it has been me making all the sacrifices on your behalf without any kind of appreciation from you to me and instead you are still insisting that I must do all that you want without you doing anything that I wanted. I have not received any $1 free from you before for my personal upkeeps but instead I have incurred very huge debts that now make all my salary to be taken by the bank every month all because I don’t want any embarrassment to my reputation and I have times without number explained this situation to you but you have adamantly flout my instructions to you to send just $500 to clear your DHL parcel case now hanging on the air with no certainty because you want to wait for me till June. > If you know what is good for you, you better send that $500 very early this coming Monday morning to Togo so that I can clear Your DHL parcel delivery case to you from Kazakhstan to you. Do this and we will be friends again! > And as concerning your assurance about the ECOWAS, FBI, Togo Presidents and the USA Embassy etc & governments and that I am not a 419 artist as you already know, what now stops you from doing what I have instructed you to do since you know that it is not a scam ? answer me ! > 2nd Floor Pyramid House, Ring Road Central, Accra-GHANA. > Tel. : +233 (0) 23 676 4471. But in Togo there is no prison term for a bribe because firstly you are not the one bribing anyone. You only need to send the money and David knows what to do on your behalf. Get someone to help you raise the money and send it by this coming Monday morning as early as possible because everyone is suffering now because of your inheritance because once you can send the $500 and you then receive your MASTER Card and account Chegue and all the stress and suffering will be immediately over ! I have already made all my necessary underground channel investigations on your behalf concerning why the ECOWAS Bank in the first place used BIA Bank Togo to effect the transfer of the $10,000,000 to your account and also the reason for the crediting code required before your bank could credit the transfer sum of ten million dollars into your local account, and I was made to know that since you requested only a small fraction of your fund to be transferred to your personal account , they (ECOWAS BANK) had to use one of their Togo sister banks which do little fund transfers to transfer the $10 million as they (ECOWAS BANK) only do huge funds transfers which you already know. Remember, ECOWAS Bank only transfer huge amounts of money which you already know; this is the reason for using their BIA Bank TOGO to do this latest transfer of ten million dollars via Windows-to-Windows Telegraphic Transfer directly to your bank account because this was what you requested the ECOWAS Bank to do for you since $10 millions was too small for the ECOWAS Bank to do directly from your account with their bank. But, the transfer was blocked by the USA Clearing House New York for all USD ($) transfers coming from Africa and European jurisdiction for due justification of fund transfers. This was the reason they placed an embargo on your bequest fund requesting the SECRET CODE of Transfer directly from the origin bank (BIA BANK TOGO) to allow them release the transfer to your bank then your bank would further receive and credit the money into your local account after the conversion of the currency from USD. So, go ahead to send the requested amount of $890 to David in Togo so that this can be done immediately and you will be happy. Note: the reason why Ceri Kolgani copied my signature in their bank mail to you was because they wanted you to get the message immediately and take it very seriously since they tried to reach you on your mobile phone number was not reachable. DIDN'T YOU KNOW THAT YOUR $10,000,000.00(UAD) TRANSFER SUM WAS DONE BY A WINDOW-TO) WINDOW TELEGRAPHIC MONEY TRANSFER? YOUR TRANSFER SUM WAS BLOCKED BY THE TCH NEW YORK DUE TO THE REQUIRED TRANSFER CODE AUTOMATICALLY GENERATED BY THE TCH NEW YORK TELEGRAPHIC SYSTEM BECAUSE THE MONEY TRANSFER WAS TAGGED "URGENT PRIORITY PAYMENT". THE SMS WAS AUTOMATICALLY WRITTEN BY TCH NEW YORK AND YOUR BANK NAME WAS USED SEND IT TO YOUR PHONE NUMBER ATTACHED TO YOUR LOCAL BANK ACCOUNT WITH YOUR BANK, JSC CAPITAL BANK, BECAUSE IT IS THE RECEIVER BANK. YOUR BANK DOES NOT NEED TO SEND THE SMS TO YOU BY THEMSELVES BECAUSE IT'S AN AUTOMATIC CREDITING SYSTEM TO RECEIVE YOUR MONEY BUT DUE TO THE REQUIRED C ODE TO CREDIT IT INTO YOUR ACCOUNT WAS THE REASON FOR THE SMS THAT GENERATED AUTOMATICALLY TO YOUR PHONE NUMBER. this is our OK approval for your transfer CODE requirement; you can go ahead and make the payment to Togo to clear the required code so that your transfer sum of 10.000.000$ USD can be credited into your account. Go ahead and send the money tomorrow morning. You have to keep it a top secrete so that your bank can receive your transfer payment sum of 10.000.000$ USD into your account. The reason I have not been able to get back to you since yesterday was because I want a positive outcome first for you concerning your transfer. But David was able to pay the balance to complete the payment on your behalf yesterday successfully and the official receipt only was give this morning because they have to process it. Now the only problem is due to the delay which was caused by t he long time duration deposit of your transfer of the $10 million dollars because you didn't pay for the transfer activation CODE and the USD dollars cash crediting into your account the Clearing House New York in America must now regulate the long term deposit duration solvency caused the delay & International Currency Marginal Fluctuation differences. To solve this in order for you to receive your fund transfer of $10 million dollars deposited cash directly into your Capital Bank account , you must urgently send the sum of $396 to get the Required done without further delay and the ten million dollars will arrive/credit into your account tomorrow morning if you send the money today. Send this sum to David urgently and send me the MoneyGram info to enable me forward to David in Togo immediately. 2nd Floor Pyramid House, Ring Ro ad Central, Accra-GHANA. YES we paid $ 273.41 for you to get the transfer in USD (dollars) Som; but what is stopping in the US dollars from crediting into your account? Just do it as you need it so that by tomorrow you will receive the money in your account. Tel . : +233 (0) 23 676 4471. How could we know that your account does not have the New York Clearing House GBN56 CODE? Yes I gave you $ 10 million dollars to pay for the transfer of money to you, is a little bit bigger and has been scheduled to be credited into your account in USD Dollars and what does not have the TCH GBN56 CODE What do you expect me to do? Go ahead and send the required sum of $ 280 to David immediately because I want you to receive your money today. You can use another bank's MoneyGram to send the money to avoid doubts and disturbance by your bank because they have contributed to the delays so far. Congratulations once again, I have read your email and i am very happy that the transfer has arrived your bank, this is great and indeed you are lucky and you will rejoice soon. I have contacted with the Central bank and BIA BANK TOGO for the International Fund transfer secret code; so that the fund will be credited into your account by your bank and they told me that you must pay $ 890 dollars immediately, so that the fund will be released into your bank account by your bank. So go and send this $890 dollars urgently; otherwise the bank will return the transfer back to Togo and it will be a problem. I am waiting for the payment receipt from Money gram. > > REASON FOR THE SMS THAT GENERATED AUTOMATICALLY TO YOUR PHONE NUMBER. > > ECOWAS BANK (EBID). > > you have to do to receive your transfer money quickly. Your payment was received and during the crediting of your fund into your account, there was error because your account is not a dollar certified account that has GBN 56/ USD ROAMING ORDER from World bank, so the clearing house demand that you pay $280 urgently, to enable upgrade the routing transmission order. Therefore you must send this amount first thing tomorrow morning and at latest 1hour later after you sent the money, the fund will show in your account. Congratulations in advance as I wait to receive the payment. Send it to David tomorrow morning. Verified, please you can go ahead to make the required payment to allow the immediate activation of your bank GBN56-USD to receive your transfer same day of payment. Сообщаем, что мы получили электронное уведомление от ЭКОВАС банка для инвестиций и развития (EBID) в Того и в Информационный центр в Нью-Йорке (США), что ваш статус перевода средств был обновлен, и ваша сумма перевода в размере 10 000 000,00 долларов США требует вашего Счет, который будет активирован с TCH GBN56 / USD, чтобы ваша учетная запись с нами в Ташкенте была зачислена сегодня. Просьба сотрудничать с просьбой ЭКОВАС Банка для инвестиций и развития (EBID) в Того, чтобы произвести платеж в размере 280,00 долларов США в Республику Т? ?го, чтобы мы могли заключить формальности и зачислить ваш счет с перечисляемой суммой здесь, в Узбекистане. Благодарим Вас за понимание и сотрудничество, чтобы получить денежный перевод. ДА, сообщение пришло к нам из нашего банка. И у нас также есть Джасур К., работающий в нашем банке здесь, в штаб-квартире в Ташкенте. Сегодня была путаница с человеком, который присутствовал на вашем деле. Вы можете выслать необходимую сумму в Республику Того за свой денежный перевод на сумму $10 000 000,00 долларов США (USD), которая будет получена и зачислена на ваш счет не позднее чем за день до ее отмены. I want to give you my last WARNING & INSTRUCTIONS now: Don't ever contact Ceri Kolgani again until I advise you again to do so. And always make sure that the email addresses you receive you always forward them to me to enable me verify them at all times. and don't respond to anybody until I tell you to do so. Quickly go back to the MoneyGram where you made the payment and instruct them to release the payment to David in Togo because he just called me now to inform me that the money you sent is not available. The money was blocked. Go and check it with them and instruct the MoneyGram to release the payment there. I hope you didn't forward the payment information to Ceri Kolgani too? I am waiting for the payment update from you urgently. Unfortunately the International Criminal Court has very limited jurisdiction, and your communication doesn’t fall into the Rome Statute Crimes. However, we would advise you to stop any further exchange with these scammers and seek help from your local authorities. We hope that your matter will be resolved timeously. Your dealings with the ECWAS BANK FOR INVESTMENT AND DEVELOPMENT - EBID, is legal and legitimate, you can go ahead to make all the required payments required for you to receive your transfer money and inherited balance to your desinated bank account. This the I have said that this is the very last payment from you, I can 100% guarantee to you this last time that this is the very last and there will be no more ever requested because it will 100% definitely solve for the last time. Send the required money and everything will be done well. Register address email domain: lawyer.com can anyone paying the corresponding collection. According to our information, this domain actively used fraudsters posing as lawyers and attorneys. 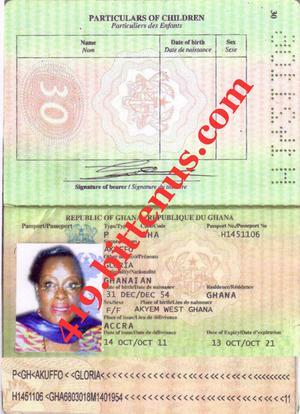 Sent You "copy of passport" Gloria Akuffo, a forgery which obviously was prepared by the scammers using a graphical editor. If you pay attention, you'll find that engraved on page 30 passport number (N1421106) differs from that indicated on the page with personal data (N1451106), and on the main page and in the running line used various fonts. Design such passports valid for 10 years in Ghana was discontinued in 2010 in connection with the transition to biometric passports of the new sample. 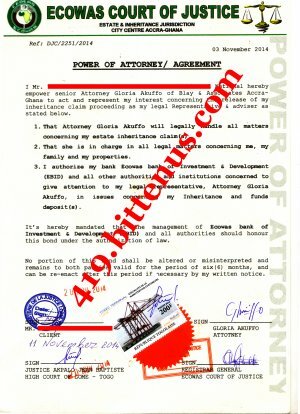 In addition, the signature in the passport and in "Memorandum on understanding" allegedly signed by Gloria Akuffo, are not the same. On this basis, believe that You correspond not with the real Gloria Akuffo and scammers operating from the territory of Ghana, which hiding behind her name extort money from You. YES of course. but to enable me meet with the Russian Ambassador personally, you have to first send the sum of $120 to the name in Togo first this morning as I have already advised you earlier. I am not telling you to go to the ECOWAS Bank, I am telling you to send the payment sum of $120 to clear the matter on your behalf so that I can arrange a meeting with the Russian Consulate and Ambassador on your behalf. > WE HAVE YOUR COMMENTS AND THE REQUESTED INFORMATION. > FOR DR AKIN MALIU. YOU ARE RIGHT ON YOUR REACTIONS,REMARKS AND COMMENTS REGARDING BEING DECEIVED MANY TIME CONSIDERING WHAT YOU HAVE PASSED THROUGH BEFORE.WE WANT YOU TO BE REST ASSURED OF THIS OFFICE WITH THE BELIEVED HOPE THAT WE HAVE NO SELFISH INTEREST OR ILL INTENTION FOR YOU IN THIS PAYMENT EXERCISE WHICH WE BELIEVE YOU WILL CONFIRM AT THE END OF THE DAY THAT WE ARE DIFFERENT FROM WHICHEVER PERSON/S OR OFFICE THAT YOU MUST HAVE DEALT WITH BEFORE.IT IS REALLY A PITY THAT YOUR PAST SAD EXPERIENCES HAS MADE YOU NOT TO BELIEVE ANY PERSON AGAIN,IF NOT THAT,YOU WILL BE REST ASSURED OF WHATEVER YOU ARE DOING WITH THIS OFFICE BECAUSE WE HAVE NAMES(UNITED NATIONS)TO MAINTAIN.YOU HAVE EVERY RIGHT TO TEST US PROVIDED YOU CAN TELL US HOW TO GO ABOUT SUCH TEST. WE HAVE IN OUR RECORDS HERE ALL THE NAMES AND INFORMATION OF INDIVIDUALS,BANKS,ORGANIZATIONS AND GROUPS THAT WERE RESPONSIBLE IN ALL THE MISFORTUNES THAT HAPPENED TO YOU IN PURSUIT OF YOUR INHERITANCE CLAIM,BOTH HERE BEFORE, AND OTHER COUNTRIES ABROAD BUT WE ARE NOT AUTHORIZED TO MENTION NAMES FOR NOW UNTIL WE ARE THROUGH WITH YOUR FUND PAYMENT SINCE INVESTIGATION ARE CURRENTLY ON GOING,EVERY DETAILS SHALL BE MADE AVAILABLE TO YOU AT THE APPROPRIATE TIME AND ONCE YOUR FUND IS TRANSFERRED TO YOU AND YOU CONFIRM SAME TO US.WE CANNOT TELL YOU WHETHER WE ARE REAL OR NOT OR SHOULD WE RATHER SAY WHETHER WE ARE DIFFERENT FROM THOSE CRIMINALS THAT DEFRAUDED YOU IN THE PAST BECAUSE THOSE EXPERIENCES HAS TAKEN TRUST OUT OF YOU AS SUCH THAT YOU DO NOT KNOW WHO IS FOR REAL NOW BUT WE BELIEVE THAT IF YOU CAN SUMMON COURAGE TO CO OPERATE WITH US,YOU WILL KNOW THE TRUTH AT THE END WHEN YOU HAVE YOUR FUNDS ALREADY TRANSFERRED TO YOU.WE DO NOT HAVE ANY OTHER INTENTION THAN TO GET THIS FUND FINALLY TRANSFERRED TO YOU AS THE AUTHORITIES CONCERNED MANDATED US TO DO. AS WE HAVE REPEATEDLY SAID,YOU NEED TO PROVIDE THE INFORMATION ABOUT YOU WHICH WE REQUESTED IN OUR PREVIOUS COMMUNICATION,AND ALSO COMMENT ABOUT THE SAID MRS JOAN C.BAILEY,IS SHE WORKING IN COLLABORATION WITH YOU YOU AS SHE CLAIMED?AS SOON AS WE HAVE YOUR COMMENTS ABOUT HER TOGETHER WITH THE REQUESTED INFORMATION,WE SHALL ADVICE YOU MORE ON THIS PAYMENT EXERCISE.THERE IS NOTHING WE CAN DO WITHOUT HAVING THE SAID INFORMATION WITH COMMENTS FROM YOU.